For the third time in his career, sophomore Michael Hnatkowsky of the Muhlenberg football team was named Centennial Conference player of the week. Hnatkowsky was responsible for five touchdowns in the Mules' 62-7 Homecoming win against Juniata, passing for four and running for one. Playing only two series in the second half, he completed 23 of 27 passes for 278 yards. The .852 completion percentage was the second-best in program history for a passer with at least 25 attempts. The win kept Muhlenberg undefeated at 3-0 and improved Hnatkowsky's career record as starting quarterback to 9-2. Hnatkowsky ranks third in the CC with his average of 247.0 passing yards per game and has thrown just one interception in 95 attempts. He is 168 yards away from 3,000 for his career. 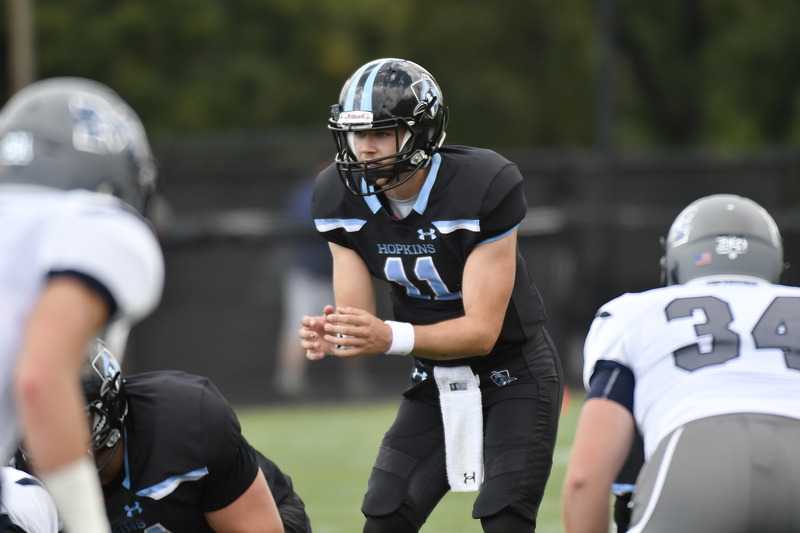 Johns Hopkins junior quarterback David Tammaro (Chantilly, VA/Chantilly) has been named the Centennial Conference Offensive Player of the Week for his performance in Saturday's 47-3 win at Moravian it was announced today. This is the first time this season that Tammaro has been honored by the Centennial. Tammaro fueled Hopkins' victory over the Greyhounds as he was 29-of-42 for 420 yards and four touchdowns and also rushed five times for 19 yards and another score. The 420 yards passing is the second-highest total of his career and the seventh-best effort in school history. In addition, his 439 yards of total offense are the third-highest total of his career and rank as the ninth-best total in school history. A Second Team All-Centennial Conference selection last season, Tammaro reached four milestones in the win at Moravian as his 420 passing yards push his career total to 4,056, while his 439 yards of total offense boost his career mark to 4,383. He is just the eighth player in school history to reach 4,000 career passing yards and just the 10th to top 4,000 yards of total offense. Tammaro also went over 300 career completions (318) and his final pass attempt of the game was the 500th of career.